Pioneers in the industry, we offer led solar blinkers, solar road flashers, sunflower solar light, solar barricade light and led warning light from India. We are a renowned manufacturer, supplier and exporter of wide range of Solar Blinkers. They are very well applicable in highway flasher and highway indication applications. The most popular benefit of this is that there is no any requirement of electric light and therefore everyone can use at any site very easily and get more benefits from this product. 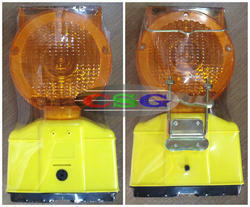 Solar blinker is useful for indication, array design, as guideline indications also. It helps to stops much accidental activity and also right for pathway and also for bump indications. Our offered Traffic Blinkers helps in effective traffic management which now days are mostly installed at various construction sites of metro projects. 6) Provided with auto on and off feature during dusk and dawn respectively. We have over two decades of vast industrial knowledge and experience in producing superior quality Traffic Warning Light. 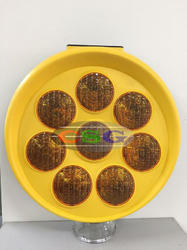 We are a renowned manufacturer, supplier and exporter of wide range of Solar Sunflower Blinkers. -No Cable laying/No Road Trenching/No Power Failure. Built Solar Panel with the fully automatic rechargeable system. Super Bright LED Lamps for a longer lifetime. Mobility/Reliability/Flexibility. 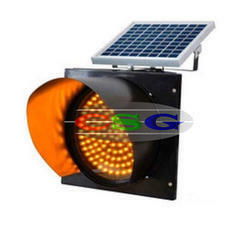 We are a renowned manufacturer, supplier and exporter of wide range of Solar Barricade Light. Solar Barricade Light run on solar energy & requires no electricity. It provides High Visibility on Foggy & Rainy Days. It is used to improve road safety and prevents accidents on road by way of warning signalling. It is also heat & water resistant. It is used at Flyover, Crossover, Road Median. 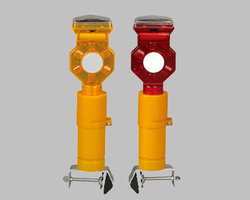 We are long-time established manufacturer, distributor, importer and exporter of Warning Light. 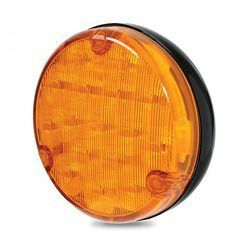 The most distinguishing feature of the warning light is enough small and light.It is small size easy to take.The diameter is just 10cm and even can be put in your pocket.The small flashing light has 12 pieces ultra-bright LEDs and the view distance reaches 800 meters.If the battery power is empty, the reflector on the lens side will show the signal for the driver in the darkness.Red lens/Yellow Lens/White Lens are designed for this LED lights.The magnet is fixed on the bottom of the base and it can be attached to the car, the door, the machine and iron pillar.The magnet base can be changed 90 degrees easily.AB-265 with handle also is very popular as traffic warning light. Looking for Solar Blinker ?